In this post we will be using project templates for code generation. 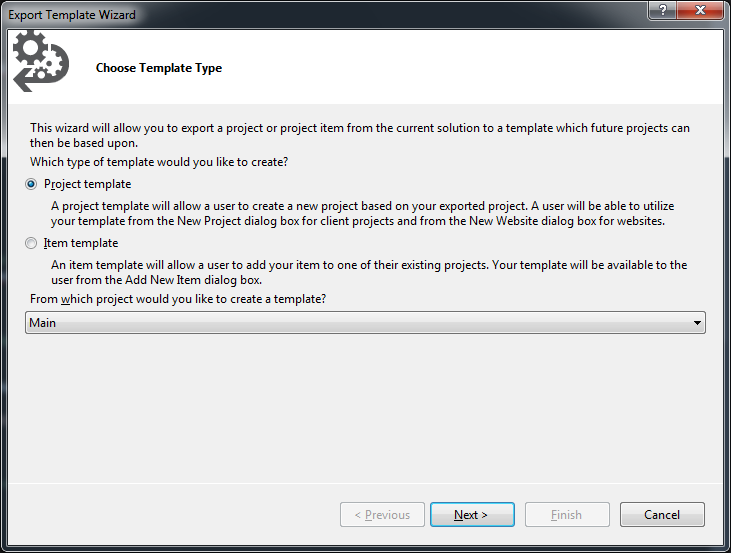 Project templates are great when you are going to create many projects with similar boilerplate type code. For example if there is a plugin architecture and each plugin has one (or many) interfaces that it must implement. In order to get started create a new project inside a solution. Write all the boilerplate code that is needed. Use the Template Parameters in the boilerplate code to make replacements. Note: it’s okay if the project doesn’t compile after adding template parameters. Make sure to setup any project specific build events, assembly references, output paths, etc. inside the project. 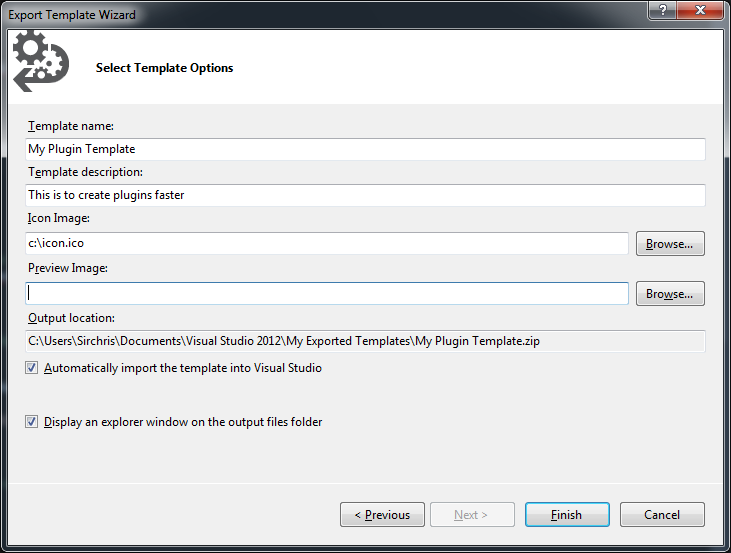 This will bring up the “Export Template Wizard”. Make sure to select the project with the boilerplate code and click next. The next page of the wizard allows some customization of the project name. Make sure to automatically import into visual studio. That it. Write code once, reuse multiple times. 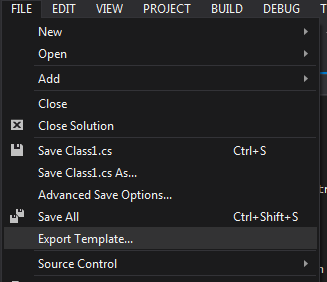 To test out the new project template go to New > Project in Visual Studio. Since the project was automatically imported the new project template is available. That’s a quick bear minimum of what can be done with project templates. Project templates can package up any set of files. In the exported template created look at the vstemplate file. There you can start to get a feel for some of the additional items that could be accomplished with templates. Make sure to look at the VSTemplate section on the MSDN. This is one of the simplest (and powerful) ways to get started with code generation. Keep them mind next time creating multiple project that are similar in nature. There are still two more examples of code generation coming up. One of the most vivid memories I have from reading the “The Pragmatic Programmer” is the tidbit about code generation it felt like my eyes were opened to this new and exotic world. All of a sudden the DRY principle had a new weapon (to be fair I think this was the point of that section of “The Pragmatic Programmer”). Up until that point I never thought about writing a code generator. I opted for code generation. Basically the pattern started an external program, started a watchdog, then called a method via reflection. Anytime somebody wanted to write a new task for the external program to do they would just need to write a new method in the class and call DoWork with the name of their method. It worked great when dealing with the same process. The issue was when wanting to use excel, or acrobat, or any other external program this whole pattern would need to be reimplemented with the logic that knew how to spin up that particular program, and have method that worked with that program as well. private static readonly string wordWatchDog = @"
Then our release build process was able to first call the console program that did the code generation before it started to build the actual solution. This first foray into code generation while crude cemented code generation as a tool in my toolbox of how to get stuff done. Since this first pass I went on to make a few more code generators. A custom C# project templates with default code. A program that reads a DB and creates C# classes to populate the tables. An app that could read a copy/pasted table for a spec on how to read a 3rd party file and generate a class that would allow the 3rd party file to be serialized into our class. None of these generators were particularly difficult to write and the pay off in terms of productivity was noticeable. Which makes me wonder why I don’t see more people writing generators. My theory is twofold, first I think code generation just does not come to people’s mind (which is odd since 99% of the coding we do is to simplify other work, why not simplify our own coding) and second I think the term ‘code generation’ sounds scary to people. My next few posts will go into more details on the aforementioned code generators to illustrate how they really are not scary, and to show how there is more than one way to generate code.